You don’t have to abandon all sense of fashion and self-image when you enter a yoga class. Let’s be honest. It’s fun to look good at the gym. Here are some of the best-looking yoga mats with beautiful designs that show off your style. Pick the one that fits you. Or who says you have to pick just one? 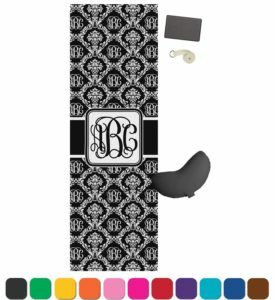 Introducing the Pretty Yoga Mat Collection! We will reveal our top picks at the end. These designs from Peace Love Yoga are some of our favorites. While the patterns are colorful and cheerful, they retain a sophisticated and muted tone that lends an air of classiness. From left to right are the Atapa, Soma, Niza, and Kama designs. While we think all the colors are beautiful, the Atapa design is something of a collector’s classic. Due to the limited availability this pattern, it retails for as much as $200 from specialty shops, while the other mats are about $50. If you want the one design that no one else will have, that one is it. 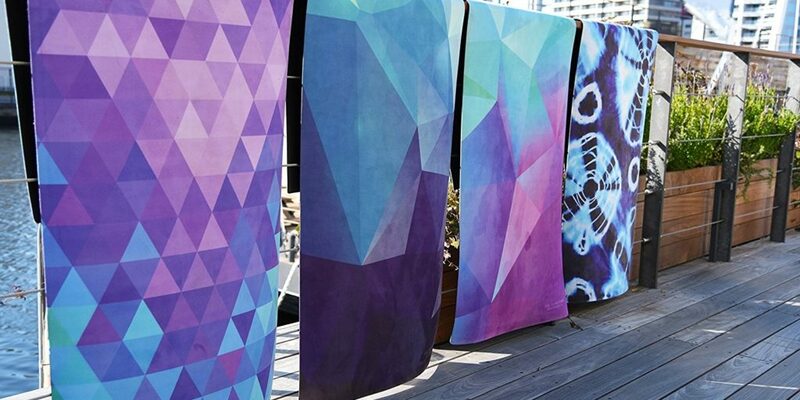 These cute designs are from DAT MAT , self-proclaimed maker of the “dopest yoga mats”. If you are looking for something cute and uplifting, these cartoon DAT MAT designs could fit the bill. The four designs you see here are Caprese Salad, Rainbow, Watermelon, and Fat Cat. Designs are in limited stock from short-run prints, so be sure to check the Amazon inventory and order any design you want right away. Each image links to that design’s order page. The Gaiam Print Premium Reversible Yoga Mats have an interesting reversible design, with a different complementary pattern on each side. You get twice the art and can pick a side depending on your mood for the day. Shown here are the Kiku and Elephant patterns. While these two-tone mats are more subdued that the other designs on this page, the reversible feature sets them apart. Sometimes less is more. Free Thirty Three makes some of the most pretty yoga mat prints. Here you see the Bermuda Triangle, Inked, Freebird, and Magic Carpet Ride (Bohemian) yoga mat designs. Their full catalog has five additional gorgeous designs. Free Thirty Three uses a mix of modern and traditional patterns with strong strokes, but keeping to mostly cooler hues prevents the designs from being overpowering. The designs are complicated enough to capture your interest, yet simple enough to avoid being distracting. 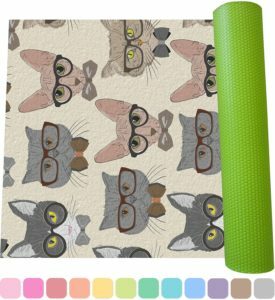 We really like the designs from Combo Yoga Mat . They are thoughtful and elegant, with a touch of modernism yet still mainstream. 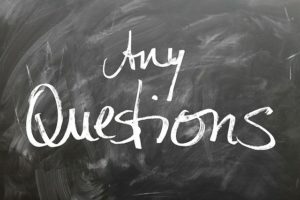 The designs are neither too loud nor too soft. They are just right! The designs you see here are the Geo, Mandala Purple, Popsicle Maze, and Floral Flow. 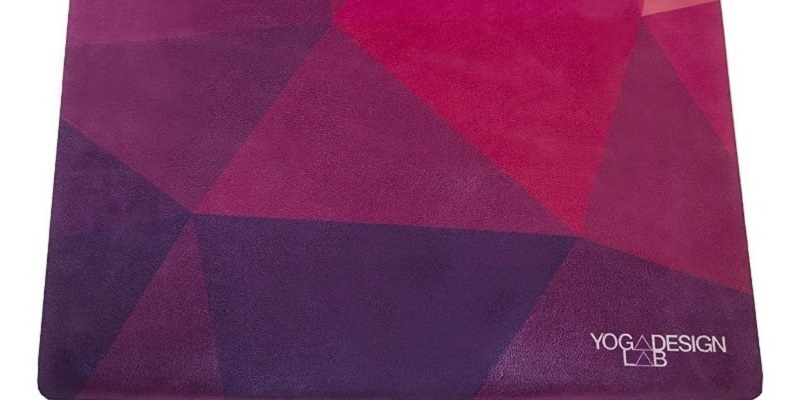 We are particularly partial to pretty yoga mats in purple shades. If you are looking for something a bit different, check out these cool yoga mats with very bold, colorful patterns from Nirvana and ToulaFit. 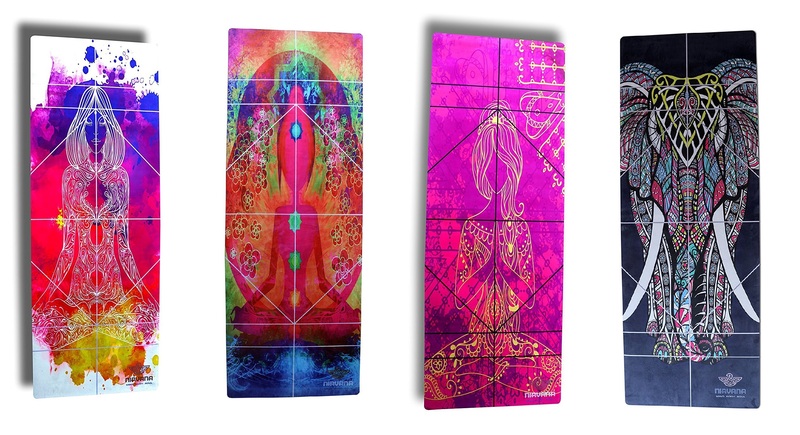 If you like these designs, also check out our collection of awesome psychedelic yoga mats. Do you like bold statements? The fusion of traditional spirituality and futuristic psychedelics from Nirvana Yoga Mats will add a vibrant energy to your yoga workout. While not for everyone, the right crowd will see that these designs are absolutely awesome. I mean, come on, check out that elephant! 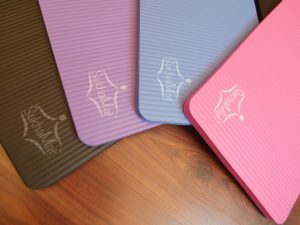 As you can see, ToulaFit offers some of the most colorful and bright yoga mats. These are the Funky Days, Spring Petals, Jungle Island, and Peacock Bliss designs. Like Nirvana, these designs follow pyschedelic color schemes with bold visuals. 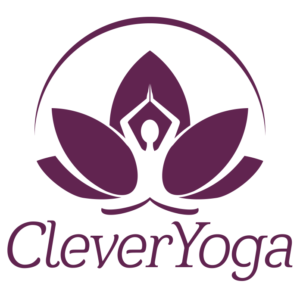 Our favorite brand for yoga mat designs is a tie between Peace Love Yoga and Combo Yoga Mat . They both have a similar sophistication to their designs, but Peace Love Yoga pursues a freeform, organic aesthetic, while Combo Yoga has clean technical patterns. To put it simply, one looks fun and the other looks cool, so depending on your mood, you could go with one or the other. Our top choices for specific designs are the Soma and Niza from Peace Love Yoga and the Geo and Mandala Purple from Combo Yoga. 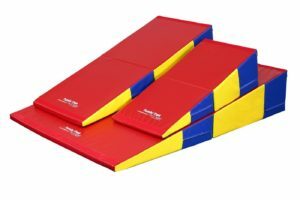 If we were looking for a somewhat bolder design, we would probably choose the Free Thirty Three Union mats. 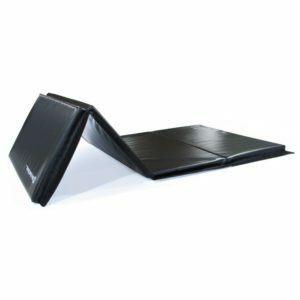 The Nirvana and ToulaFit mats are even louder, but sometimes seem a bit simplistic in their designs. For something completely different, we also like the Rainbow and Fat Cat designs from DAT MAT. They stand out as a hip casual urban alternative to the more common naturalistic themes from the other companies.